PS Vita dungeon RPG headed to PC. 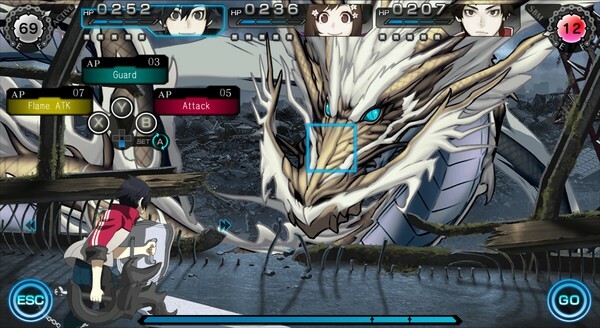 Ray Gigant, which launched digitally for PS Vita in North America and Europe on May 3, is coming to PC via Steam on August 10, a newly launched Steam page for the game reveals. Ray Gigant is a unique dungeon crawler RPG which combines dungeon crawling adventure with Japanese visual novel like story telling. Players will first be introduced to the gripping tale of Ichiya who is a young fighter shrouded in mystery. As the story progresses the player will be introduced to new characters which you later get to experience as the main character. There are a total of 3 different tales told in the perspective of Ichiya, Kyle and Nil. Unlike ordinary turn based RPG battles, Ray Gigant adopts a unique style where you will be fighting massive enemies from different distances and perspectives. Your party is comprised of 3 characters, each with their own unique abilities to engage in 3-way view battles. Also use the rhythm-based, Slash Beat system to unleash deadly attacks while feeling the fate of the heroes and heroine resonate through their bodies! In Ray Gigant, players will start off with the story part to set the setting and then adventure off into the dungeons for exploration and battles. Your team will be comprised of three characters, each with unique abilities and will have to face various forms of enemies. After boss battles there will be event scenes to further progress the story. In Ray Gigant, the story progresses by exploring and clearing the various dungeons called Megalosites. There a number of these dungeons and players will explore them on a 3D map. The game features a dynamic 3-way view battle against towering Gigants. When facing huge Gigants, the characters within the party take position from 3 distances, each facing the Gigant with methods fit for use from their positions. With the Yorigamis in coexistence with Ichiya and others, they gradually are taken over by the Yorigami, thus imparting the state of Parasitism. During this time, the characters will fight at the expense of their very lives. Slash Beat Mode, aka SBM, is a special skill that can be unleashed by spending Slash Points (SP). Normally you are only able to execute an action 5 times per turn, but by using SBM you can execute a command over a 100 times. The leveling within the game is done through the Evolve Tree system. The tree branches into 3 different categories, each with a distinct feature to them. View the first set of PC screenshots at the gallery.